If you are into reading about weight control as most people with prediabetes or diabetes are, you are likely to have heard about Wheat Belly, a book that portrays wheat as the culprit in our obesity epidemic. 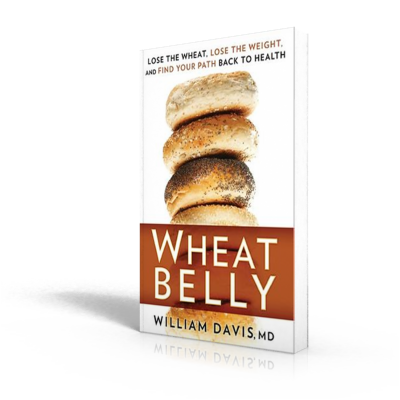 The author William Davis MD, a cardiologist, connects two occurrences: the increase in obesity since the 1970’s and the government guidelines to lower fat in the diet which he says led to an increase in carbohydrates, specifically wheat in the diet. In addition, our wheat supply has been genetically altered to provide high yield and pest resistance over the last 50 years so that what we eat now has never been tested on animals or humans. Add to this the gluten scare going around that has so many people saying they are gluten intolerant and you lead right into his premise: Give Up Wheat! Although what the book promotes is basically a food fad, there is some merit to his argument. Many of us do eat too much bread, crackers, cookies and cake and all the other things where wheat shows up, such as breading on meat and fish and as additives in condiments, sauces and so forth. Give up wheat in all of these and he says you will lose weight, your skin will clear up, and your cataracts, wrinkles and dowager’s hump and other signs of aging will disappear. Your heart will strengthen and your brain will sharpen. He goes so far as to prohibit from the diet any other grain besides wheat that has gluten, which becomes an extremely restrictive celiac diet. For a full discussion of this disease see Celiac Disease by Peter H.R. Green, M.D. and Rory Jones. I don’t know about the rest of the claims, but I believe you will lose weight giving all of this food up as you would in any diet this restrictive of carbohydrate. Do you remember the Adkins diet and other low or no carbohydrate diets? The question is: Even if you lose weight on this diet, can you maintain the weight loss on a diet this restrictive? And what else are you eating and what is that doing to the body? He suggests including in your wheat restricted diet whole fat cheeses and red meat to provide calories and variety. This is a very problematic answer to the question of what can I eat. In the chapter called Diabetes Nation: Wheat and Insulin Resistance, he makes some interesting points about diabetes but much of what he says has very little science to support it and no large scale clinical trials that show what happens when a large number of people try the diet he suggests. A better option for a low carbohydrate diet for people with diabetes has been developed by Richard K. Bernstein, M.D. as presented in The Diabetes Diet. Furthermore, a better way to avoid the glucose spikes that occur after eating many simple carbohydrates is provided by assessing the glycemic index of carbohydrates and eating those that rank lower on the GI scale.